Note: As of 2/05/07 the building appears to be undergoing a remodeling project - the extent to which it may be altered is not known. Prominently located along the entire blockfront on the west side of Third Avenue between Pine and Stewart Streets, this ten-story parking garage includes commercial space at the base. The site is trapezoidal in shape due to its adjacency to Stewart Street, which runs at an angle to the principal layout and street grid pattern of the commercial core to the south. However, while the footprint of the building runs parallel to the adjacent streets and alley to the east, south and west – the northeastern corner radiuses to align with the Stewart Street frontage. It measures approximately 111’ x 273’ [with the exception of the curvilinear NE corner] and exhibits a particularly unique building form and exterior appearance and is a noteworthy example of Miesian-influenced Modern architectural trends. 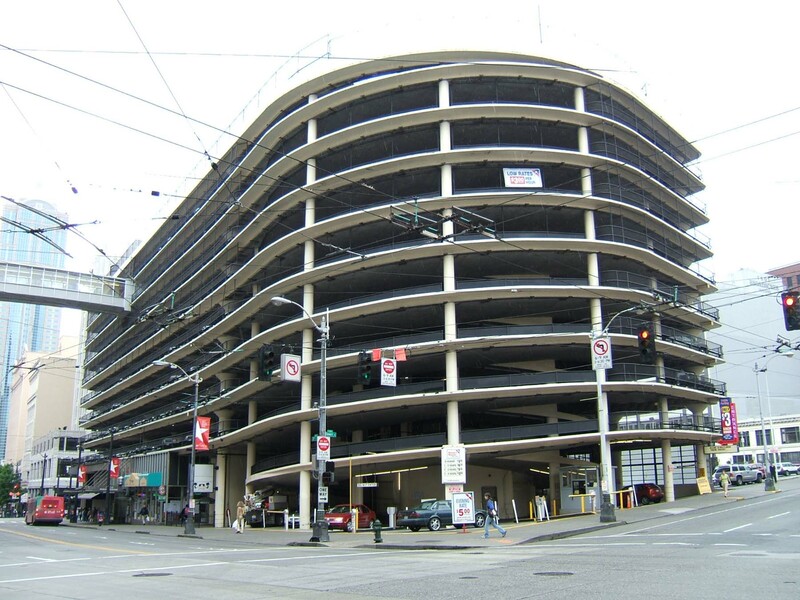 The entire parking garage is serviced by a bank of three elevators housed within an elevator and stairway core at center of the building. An additional exit stairway is located at the SW corner. The spiral (circular) entry and exit ramps at the north end of the building have an overall 50’ radius and are visible at the curvilinear NE corner of the building. The total floor area of the building is approximately 243, 670 sq. ft. with the large former bank space (with a mezzanine level) taking up approximately 88’ x 111’ at south end of the base. The elevator lobby space occupies a 41’ wide bay near the center of the base with direct access from Third Avenue. This unique steel reinforced concrete structure includes a concrete foundation and full basement level. The reinforced concrete parking level floor plates are built on a structural grid primarily composed of 41’x 41’ bays. The concrete structural system is fully articulated and visible with the exception of the retail and lobby portion of the base [at the center and south end]. All of the finished concrete is painted cream white. The typical finish floor to finish floor height is 9’-6” and the thin edge of each of ten parking floor levels creates a dramatic series of stacked narrow horizontal floor plates. At the parking levels each of the floor plates is subtly supported by 4’ round fluted columns set back 14’-6” from the face of the floor plates. At the curvilinear NE corner and north elevation, where the spiral ramps are located, the floor plates are supported by more slender round columns held back 6’ for the face of the floor plates. Originally low pipe railing and some continuous concrete panels were all that enclosed the parking and ramp levels, now black chain link mesh screens enclose openings at the upper four floor levels. Due to their black color the original pipe rails, modern mesh screens and concrete panels have minimal visibility and the entire building form is dominated by the horizontal expression of the concrete structure. A mechanical penthouse is situated at the uppermost parking level. The original modern glass, metal and aluminum storefront design along Third Avenue appears to be intact and relatively unaltered. Changes appear to have been made to the retail/bank space at the southern end of the base but further investigation is required to determine the scope of the original design. The elevator lobby level includes original terrazzo floors. A steel and glass skybridge interconnects the garage to the adjacent major department store building (former Bon Marche) at the 8th floor level.